A Resistance Suit is a full body resistance training gear that provides much-needed muscle benefit for the entire body. It is made up of resistance bands attached to particular areas of the suit to improve speed, power, muscle strength, endurance and core strength. Also called MASS Suits, resistance suits are gradually taking over accelerated fitness for all kinds of athletes. A Weighted Vest, on the other hand, is a vest that contains weights and is worn to make workouts more demanding. The aim of using a weighted vest is to temporarily increase the bodyweight in order to increase the efficiency of a workout session. Fitness research documents that weighted vests are mostly useful during warm-up sessions before the real training. This means that you can warm up in a weighted vest and then use a resistance suit for the main workout. Weighted vests are ideal when all you want is weight training to burn calories. This means that most athletes and trainees only wear a weighted vest while doing routines that involve running and jumping. These vests are used to make pushups and lunges more demanding, while some people will also use them in step aerobics. While it may be difficult to know how much weight you should be carrying around in a weighted vest, most trainers recommend between 8 – 15% of total body weight. Even so, it takes a lot of effort to measure the positive effects of using a weighted vest. When choosing the ultimate wearable training tool, everyone wants something that will maximize the associated benefits to the whole body. The best results of working out require a tool that targets all muscle groups and produce quick results in less time. That is what researchers and fitness designers had in mind when they designed the resistance suit. Mass Suits (Maximum Athletic Sport Suit) or resistance suits can be used by anyone. If you are looking for the extra punch in resistance training as well as speed training, you should get yourself a MASS Suit. The same applies to sportsmen and women who need agility and endurance on the pitch. Resistance suits are the ideal solution for increased balance, side to side agility, muscle coordination, leg and arm strength, endurance, vertical explosion, speed, core strength, and full body performance. You can perform a variety of gym exercises while wearing a resistance suit for better results. If you are wondering how a resistance suit works to deliver so much, visit JukePerformance.com. They feature one of the world’s most sought after accelerated fitness tools – the MASS Suit. You will be surprised to find out that resistance suits are now being used by cerebral palsy patients and even injured soldiers in water training and rehabilitation to increase and strengthen bone density. Even distribution of vertical and horizontal resistance Unlike a weighted vest, a resistance suit distributes horizontal and vertical resistance to the whole body during a workout session. Every movement you make while wearing a resistance suit is enhanced many times over. When tested on athletes, resistance suits were found to help the body work against the resistance force of the suit, resulting in better performance of small and large muscles as well as fast twitch muscles. As opposed to weighted vests, resistance suits are currently being used by people with special needs and disabilities. The fitness industry is actually seeing an increase in the number of physiotherapists who recommend resistance suits for wheelchair fitness. Injured soldiers also use mass suits to restore muscle strength and normal functioning to affected limbs. A recent test study by Lifetime Fitness revealed that using a resistance suit when training helps an athlete improve their (Volume of Oxygen) or VO2 score. The Volume of Oxygen score is a common term in athletics, which denotes the maximum amount of oxygen that the body is able to utilize at a given time. When you have a high VO2 score, it means that your body is able to use more oxygen, resulting to longer and more efficient workouts. As soon as the MASS Suit was launched, a number of notable trainers of pro-athletes tried it out. The impressive results in just a short time triggered a massive shift from weighted vests to resistance suits. While the conventional weighted vest is only concentrated on the upper body, the resistance suit is a full body kit that is not biased to a particular part of your body. 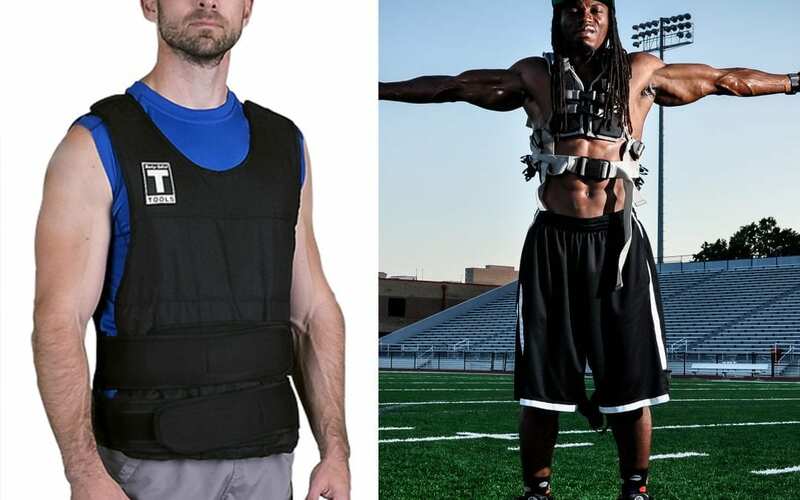 The introduction of the MASS Suit also revealed a myriad of challenges and problems that athletes were facing while using the weighted vest. Here are some of the issues raised by people who once used weighted vests. Naturally, weight should be supported from below the hips. That is why the human body stores excess weight above the waist. By wearing a weighted vest, you are straining the back and causing unnecessary vertebrae compression. Since the added weight of weighted vests has to be supported by the shoulders, pinched nerves in the spinal column and shoulder injuries could become common. As such, people who have a history of back and shoulder problems should never use weighted vests before being cleared by a doctor. In addition to the shoulders bearing the immediate weight of a weighted vest, the extra weight of the torso will eventually have to be borne by your hips, knees, and ankles. Running or jumping while wearing a weighted vest can cause potentially serious joint problems. These can come about when the joints that support your body’s weight are strained and irritated. The only way to prevent joint pains when using a weighted vest is working closely with a professional trainer who will guide you on maintaining proper form. Weighted vests are not the most comfortable workout clothes you will find. Most customer reviews even on the most popular vests highlight that it is pretty uncomfortable to workout in a weighted vest. This is especially so if you have to perform bending or jumping exercises. One should really consider a resistance Suit over a weighted suit when looking for longevity and enhanced physical performance.